The Earthway 6500W High Wheel Cultivator is ideal for a multitude of garden jobs. From light plowing and hilling to furrowing, and cultivating this Earthway Cultivator is a very versatile tool. The frame is constructed of heavy duty one inch plated tubular steel that is powder coated for long life. Solid oak handles add classic appeal and durability. The 24 inch steel wheel helps move the cultivator through the soil more quickly than comparable models. Both the 3 Position handle height and tool depth can easily be adjusted to individual needs making this cultivator more versatile than most. Twin End Furrow Plow - For making seed furrows. Double ended and reversible tool makes two sizes of furrows. 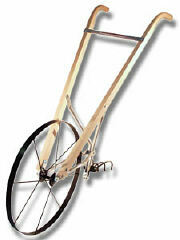 Please note: This Cultivator is intended for use in soil already plowed or tilled. It is not designed as a ground breaking tool. The optional Earthway Garden Cultivator Slicing Hoe allows you to easily cut weeds below the surface.